. . . but am very happy to receive as presents. I’ll begin by saying that I do buy a lot of books. But there are certain categories I tend to avoid. I already pay a hefty subscription to the London Library, so I try not to buy books that I can borrow: biographies, non-fiction more generally, Golden Age crime and ‘literary’ novels (ridiculous expression). So it’s especially a treat to be given a beautiful hardback novel as a present. I was pleased to receive Peter Carey’s Amnesia for my birthday in December, particularly as he is an author I don’t really know. It’s good to have one’s horizons broadened. The London Library doesn’t stock a lot of new crime so that’s mostly what I buy in paperback or ebook form. 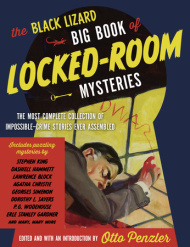 But even then I might hesitate over something that seems a bit self-indulgently expensive and that is what happened with The Black Lizard Book of Locked-Room Mysteries, edited by Otta Penzler, which came out in November. £15 or thereabouts did seem a lot for a paperback, so I was thrilled to get this from my brother. Actually it is great value: 69 stories in 937 double column pages. The subtitle is ‘The Most Complete Collection of Impossible-Crime Stories Ever Assembled’ and I am ready to believe it. There are some well-known stories in here, but lots that I hadn’t read. I am savouring them: reading one or two a day. Perfect for these dark, wet January days. Oh, and I love the pulpy cover. Same here. Lisa. There is something luxurious about gift vouchers, I agree.